No two people have the same hearing and lifestyle needs. Therefore we provide free hearing consultation appointments to assess the degree of hearing loss that may exist and recommend a treatment solution. 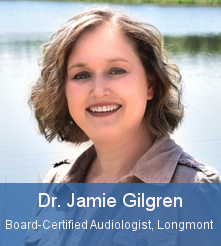 Dr. Jamie Gilgren has been practicing audiology and fitting hearing aids since 2002. She is board certified by the American Board of Audiology. She earned her Doctorate Audiology from Pennsylvania College of Optometry, a Master’s degree with an emphasis in Aural Rehabilitation from the University of Texas at Austin, and two Bachelor’s degrees in Speech Language Pathology and Audiology from the University of Northern Colorado. She has extensive experience fitting and programming today’s latest hearing aid technology, Bluetooth technology, and assistive listening devices. She also has extensive knowledge in the diagnosis and treatment of hearing disorders. Dr. Gilgren takes pride in doing the best job for her patients and enjoys helping people of all ages to hear and communicate better. Dr. Gilgren spends her free time four-wheeling and camping with her family. Dr. Gilgren was voted Best of Longmont in 2013, 2014, 2015 and, 2016 by the Readers’ Choice Awards Times-Call Newspaper. Kathy Harvey joined HRC in 2010 and hopes to work for the company until she retires as she loves being able to help people on a daily basis! Kathy lives in Longmont and enjoys spending time with her two children when she’s not helping patients.